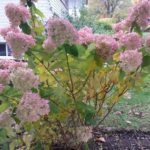 I am looking to find out, should I be cutting back my hydrangea to the crown at in the fall or waiting until spring? I had lots of lovely blooms this year, it is about 4-5 feet tall. Limelight hydrangea, H. paniculata is a panicle hydrangea. Late winter or early spring is the time to cut these shrubs all the way back to the ground. They will produce much larger blooms if pruned hard like this each year. Some gardeners prefer to leave a framework of old growth to reduce flopping. This may result in smaller blooms but on sturdier stems.